"Manfred Kets de Vries is in a unique and special position to analyze leadership, human development, behavior, and what it takes to be an outstanding leader. Manfred's book, like all his other works, is worth reading several times, preserving it for reading again and again and to reflect and learn." - B Muthuraman, Managing Director, Tata Steel Ltd.
Manfred Kets de Vries brings a much-needed fresh perspective to the subjects of leadership and change, drawing on his knowledge of economics, management psychology, and psychoanalysis. He is Clinical Professor of Leadership at INSEAD, where he holds the Raoul de Vitry d'Avaucourt Chair of Leadership Development. He is the Distinguished Visiting Professor of Leadership Development Research at the the European School of Management Technology (ESMT), Berlin. He has also held professorships at McGill University the Ecole des Hautes Etudes Commercials in Montreal, and Harvard Business School, and has lectured at management institutions all over the world. he is the author, co-author, or editor of more than 30 books including The Leader on the Couch and Family Business on the Couch, and over 300 articles and papers. In November 2008, Manfred Kets de Vries was honored with the Lifetime Achievement Award at the International Leadership Association in Los Angeles. He and six Others were inducted into the Leadership Legacy Project as "founding professionals of the development of leadership as a field and as a discipline.'" Previously, in 2005, he as the first non-American recipient of the ILA Leadership Award for his 'contributions to the classroom and the boardroom. He is listed as one of the Top 50 Management Thinkers of the world for 2009. The Financial Times, Le Capital, Wirtschaftwoche and the Economist have also judged him one of the world's leading thinkers on leadership. Part 1: The Origins of Leadership. Chapter 1. Narcissism and Leadership. Chapter 2. Why Follow the Leader? Chapter 3. The Dance of Leaders and Followers. Chapter 4. Listening with the Third Ear. Part 2: Leadership and Personality. Chapter 5. Vladimir Putin, CEO of Russia, Inc.: The Legacy and the Future. Chapter 6. 'Complex' Executives I have 'Met' in Coaching and Consulting. Chapter 7. Leadership Archetypes: A New Organizational Constellation. 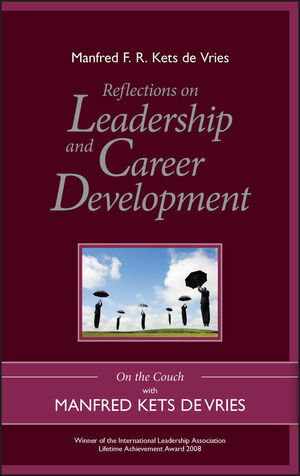 Part 3: Leadership and Career Development. Chapter 8. Midlife-Stop the World, I Want to Get Off. Chapter 9. The CEO Life Cycle. Chapter 10. The retirement Syndrome-The Psychology of Letting Go.